You are invited to the ISAM Gala Concert concert and prize giving ceremony held on Thursday 9th August 2012, 7pm, at the Bibliothekssaal Ochsenhausen (Landesmusikakademie Baden-Württemberg, Schloßbezirk 6, Ochsenhausen, 88416, Germany). Violinist Karen Bentley-Pollick, cellist František Brikcius, pianist Sabine Sauer-Essl and percussionist Aurélien Hadyniak will feature brand new music written by winners of the Joseph-Dorfman-Composition Competition. Event is free and open to the public. In cooperation with the Landesmusikakademie Baden-Württemberg and the Center for Jewish Culture and Creativity, Los Angeles. 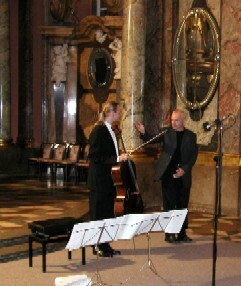 Further details on websites http://www.Brikcius.com , http://www.FaceBook.com/Brikcius.Frantisek , http://www.ISAM-Masterclasses.de , http://www.Landesakademie-Ochsenhausen.de , http://www.KBentley.com & http://www.OferBenAmots.com/ISAM . 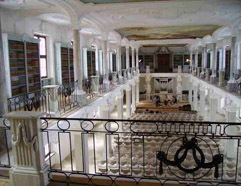 "ISAM GALA CONCERT" & "THE JOSEPH-DORFMAN-COMPOSITION COMPETITION"
Thursday 9th August 2012, 7pm, Bibliothekssaal Ochsenhausen (Landesmusikakademie Baden-Württemberg, Schloßbezirk 6, 884 16, Germany). 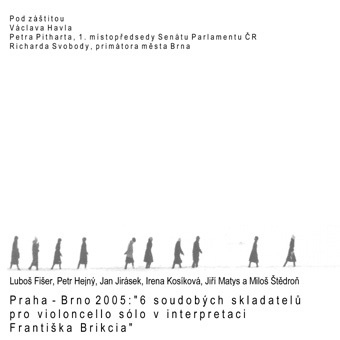 Competition: Win 1 x 1 CD "Prague - Brno: 6 Contemporary Composers for Solo Cello in the Interpretation of František Brikcius"
What is the name of composition by Jan Jirásek featured on CD "Prague - Brno: 6 Contemporary Composers for Solo Cello in the Interpretation of František Brikcius"? Contest is over, lucky winner is W. N. from Berlin. The International Summer Academy of Music (ISAM) deepens musical skills and expands musical horizons through high quality workshops, seminars, lectures, concerts and competitions, aimed at selected young and gifted musicians from across the globe. ISAM encourages a coming-together of musical minds. The hallmarks of the Academy's training program are daily individual lessons and numerous performance opportunities, culminating in a competition for the pianists, composers and organists judged by an international jury comprised of the faculty and invited guests. One of ISAM's objective is also to revive and strengthen the role of Jewish music and Jewish musicianship in Europe, particularly in Germany. The intensive educational and musical frame enables positive interaction between students of different background, religions, and cultures based upon artistic creativity. Another goal is to create meaningful interaction between ISAM’s participants and the local community and audiences. For that reason, all concerts, recitals, competitions and cultural events are free and open to the public. ISAM was founded in 2005 by composer and musicologist Joseph Dorfman (1940 - 2006), pianist and pedagogue Lily Dorfman, and composer and Jewish music scholar Ofer Ben-Amots. With the generous support of the Center for Jewish Culture and Creativity ISAM developed and quickly gained the reputation of a top-quality place of creativity and musicianship. All ISAM participating composers are invited to partake in the Joseph-Dorfman-Composition Competition. This competition is intended to increase the excitement, energy, and creativity among our hand-picked young and talented composers, while at the same time generate a harvest of new, beautiful, and highly artistic works. The competition carries the name and blessed memory of ISAM co-founder, composer, pianist, musicologist, teacher, and visionary leader, professor Joseph Dorfman (1940 - 2006). For more details visit websites http://www.ISAM-Masterclasses.de , http://www.OferBenAmots.com/ISAM & http://www.Landesakademie-Ochsenhausen.de . František Brikcius: Mr. Jirásek, you took private composition lessons with Prof. Miroslav Raichl and you studied composition with Prof. Zdeněk Zouhar at the Janáček Academy of Music (JAMU) in Brno. How did both composers influence you? Jan Jirásek: I have to admit that I liked both of my teachers. But I did not want too much to be under their influence. My growth as a composer was affected by many other people as well. F. B.: During your studies at the JAMU, you already worked as music editor and producer of the Czech Radio, where you worked till 1994. Can you describe what were your main activities? 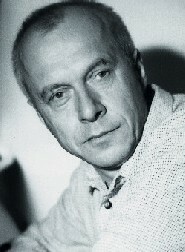 F. B.: In 1991 you won the Czech Music Foundation Award for the composition Labyrinth. Did it affect your professional career? J. J.: Any award is a positive motivation. This one did not much affect my future career. F. B.: Since 1996, when you won one year visiting professor Fulbright Fellowship in the USA, you are annually teaching at various universities in the USA (Hartt School of Music in Connecticut, Colorado College in Colorado Springs, University of Colorado in Boulder). Could you compare professional life of composer in North America and Europe? J. J.: A composer writes his music no matter on which continent he lives at that time. Important is to find a good performers/ensembles for your music. I was always lucky to find good people, publishers, recording companies. F. B.: Just before you left to the USA, as part of the Fulbright Fellowship, you wrote music for the film An Ambiguous Report About the End of the World (1997) by Juraj Jakubisko. You were awarded the prestigious film music prize the Czech Lion (1997) for this movie. Your cooperation followed years later on his film Bathory (2008), which was realised in difficult conditions in international production. How would you describe cooperation with legendary Slovak director? J. J.: My first cooperation with Juraj and Deana was on the film "An Ambiguous Report about the End of the World". They are no easy persons to work with. Juraj is a very curious kind of a director trying all possible combinations. The composer is supposed to adjust to his imagination immediately. F. B.: How did you create music for the film Wild Flowers (2000) by Czech director of photography and director František Antonín Brabec? You were awarded another prestigious film music prize the Czech Lion (2000) for this movie. What is your relationship to literature? J. J.: I wrote the score for "Kytice" (Wild Flowers) within six weeks including the post production. I liked the director's concept because the topic is very dramatic, mysterious and spiritual. F. B.: You are one of the six composer composers of project "Prague - Brno: 6 Contemporary Composers for Solo Cello in the Interpretation of František Brikcius" held under the auspices of Václav Havel and featuring your composition Dilemma. Why Dilemma? J. J.: I wrote the "Dilemma" in 1987. My family and me wanted to leave the country because of the communist regime. It was a big dilemma for all of us. F. B.: What are you working on at the moment? J. J.: Now, I am working on a new film by Jiří Strach. Its title is "Šťastný smolař". what could be eventually translated like "A Lucky Loser". Despite its title, the movie (a fairy tale) is very funny. Then I'll start working on a commission to write a ballet for the National Theatre in Prague. F. B.: Pen and music paper or computer? Eventually Finale or Sibelius? J. J.: I use computer, it's a more sophisticated pen for me. I use Sibelius, for film scoring I use Logic Pro. J. J.: I enjoy all positive faces of life. A lot of things can make me happy - that my family and I are healthy and we can do jobs we love. The happiness for me is not having what you want to have or posses but to want what you have already. F. B. Thank you for your time and answers. For more information about Jan Jirásek visit http://www.Brikcius.com , http://www.JanJirasek.com , http://www.CSFD.cz and http://En.Wikipedia.org/Wiki/Jan_Jirásek .